Celebrating listening, creativity and detail since 1989. We’re an intimate, collaborative studio of savvy interns and experienced leaders, focused and organized to serve our clients. The beginner sees endless possibilities. The master sees few. We listen to the land, observe the natural patterns, discern the light…, and hear our clients – plainly and implicitly. Then we explore. Our pen strokes yield broad concepts…, then thorough detail. Everything is considered. From our Vail/Beaver Creek studio, we’ve been creative across North America…, Beacon Hill to The Presidio…, rural Edmonton to the Park Cities of Dallas. We enjoy engaged clients and remarkable properties, wherever they may be. We’ve worked with many architects. Far and away the best experience. Client for residences in Beaver Creek and the Nantucket shoreline. Architecture is more than a profession for Doug, one of our principal designers. It is a calling, understood since childhood. While a modernist at heart, his work reflects the necessary context of each setting and the voice of each client. He trained in the program of modernist and former Bauhaus director Ludwig Mies Van der Rohe, at IIT’s School of Architecture in Chicago. After working throughout the nation and overseas, Doug settled in Vail in 1985, where he met his wife, Charlotte. Together they founded the practice in 1989. Doug’s priorities upon listening, creativity, detail and service, as well as the sanctity of the individual, became the core values of the studio. He is a member of the American Institute of Architects, certified by the National Council of Architectural Registration Boards, and has been licensed in numerous states. He finds balance in guitar, golf, stone sculpture, hiking and snowshoeing. As a young artist, Charlotte tailored her pre-architecture undergraduate degree at Colorado College, in Colorado Springs, and completed her Master of Architecture at the University of Colorado, Denver. She is an observer, analyst and critic of our processes, and her imagination inspires and contributes to our creativity. Of the partners, Charlotte’s willingness to raise the children fostered Doug’s ability to focus upon the practice. She is a lifelong resident of Colorado, skied Vail in the early years as a child and remains an excellent bump skier (if the sun is shining). She was an original teammate of the Vail Breakaways, Vail’s first women’s hockey team. After graduating from Illinois Institute of Technology’s School of Architecture in 1995, and interning for three years at Chicago’s famed studio, Fujikawa Johnson and Associates, Adam packed his van and toured America for several months. He found Vail and us about the same time in 1997. Since then, he’s been a stalwart of our studio, a strong, collaborative design voice, and has managed some of our most complex and leading edge custom homes with a designer’s sensitivity. His priority upon sustainability, his leadership skills and his mentoring of the younger staff uphold the core values of our practice. Adam earned the position of equity partner in 2017 and will professionally guide our studio into the future with great passion. He is licensed in Colorado and Michigan, certified by NCARB, and serves as the senior member of the Red Sky Ranch Design Review Board. Adam is a committed music enthusiast, skilled golfer, mountain biker (but not skilled) and finds himself on the mountain…, whenever he can balance architecture with his wife and daughter. Upon earning his degree from the University of Cincinnati, Tom combined his love of the sporting mountain life with his passion for architecture by moving to Vail in 1989. He practiced for 13 years at the influential Vail studio, Morter Architects, developing his uncommon design skills while rising to partnership. Upon that studio closing in 2009, Tom practiced solo, as Tom Cole Architect, where his focus upon ranchlands of the American West, conservation and ranch architecture began to flourish. Tom joined us in 2015, to fulfill our search for a lead design architect and his interest to again join a dynamic studio. Our collective passions and skills have resulted in an amazing collaboration. Tom is a gifted, instinctive designer. Highly descriptive architectural studies, sketches, graphics and renderings flow easily, quickly and directly from his imagination to his hand. He is an unparalleled collaborative design partner, both in the studio and with our clients. His passion for rural, retreat and ranch properties contributes to this priority in our studio. Our studio is fortunate to have Laurie bring her considerable experience in business and finance to our daily operations. Among her many administrative responsibilities, she manages accounting, payroll and invoicing for us. When not busy here or as a private chef, she avidly hikes in our beautiful summers and snowshoes in the winter. Daniel earned his Master of Architecture in 2012 from Andrews University in Berrien Springs, Michigan. His considerable digital skills, specifically in Revit Architecture, and his willing attitude, support our project managers and contribute significantly to successful completion of our projects. Daniel is also our go-to individual for internal IT support. His design voice and effective project management skills are emerging. Because he was raised in a skiing family and has skied since age 4, Daniel thrives as part of the Vail/Beaver Creek community. His passion for travel has taken him to much of America, Europe and the Middle East. Bert found a home away from home in the Vail Valley while exploring North America’s most beautiful landscapes on a post-graduation road trip…, from his hometown of Bellvale, New York to Wasilla, Alaska. He had completed his studies at SUNY Buffalo and apprenticed with two well-known firms in New York’s Hudson Valley area before joining our studio. As the son of a general contractor Bert gained practical construction knowledge with hands-on experience in the field. His many professional attributes are exceeded only by his wonderful, collaborative spirit. Naturally, Bert is an active individual who embraces hiking, biking and skiing in our amazing Colorado mountains. From an early age, Ben had pen in hand and a curiosity for exploring both natural and built environments. Much of his adolescence was spent drawing what he observed, balanced with his passions for cross-country skiing the New England forests and playing soccer as far away as Europe. Like many of us, Ben arrived in Colorado as an adult, following a lifelong passion to further pursue the resort lifestyle. After graduating from the University of Colorado, he practiced with some of the finest architects and builders in the region, creating fine homes and other structures. His broad experience includes California mountain resort homes, as well as mixed-use and commercial structures, peppered with an interesting mix of furniture building and construction. In our studio, Ben is a strong design voice and outstanding project manager, leading by quiet example as he mentors our emerging leaders. Ben remains passionate about skiing and soccer, coaching both youth sports locally. Travel remains in his blood as he and his family explore the west in their vintage 1967 camper. Cam was introduced to Colorado’s rivers and mountains at an early age, returning annually from Michigan with his family to fly-fish and hike near the small mining town of Creede. His interest in design and architecture was ignited by his high school drafting teacher, who instilled a balanced approach to design through technology and craft. Cam received his BA from UNC, Chapel Hill, followed by a few years of medical research before heading West to earn his Master of Architecture from the University of Oregon. There he became interested in the interdisciplinary study of Biomimicry; an approach to solving design problems by looking to nature. Not coincidentally, this interest, the stunning landscapes, wildlife, and outdoor lifestyle led Cam back to Colorado in 2014. He joined us in 2017, quickly becoming a central piece of our culture and project management structure. Cam serves on the Design Review Committee of the Arrowhead at Vail community, is a certified Biomimicry Specialist and licensed Architect in the state of Colorado. His other pursuits include fly-fishing, skiing, hiking, and a good game of euchre…, and the list continues to grow. He is married to a wonderfully talented children’s book illustrator, and dotes on his young son. Emily joined us from the DC area, lured by the mountains, our core values and our creative environment. She earned Master of Architecture and Bachelor of Science in Architecture degrees from SUNY Buffalo’s School of Architecture & Planning, with a minor in Earth System Science. Through her wonderfully infectious spirit, Emily eagerly contributes diverse knowledge and experience, having worked on historic National Park Service documentation, and urban high-density residential projects facing strict constraints. She is a productive and dedicated team player who thrives through learning and contributing to the growth of others. Her detail, project management and organizational skills are exceptional. Emily is licensed in Maryland, and nationally accredited by the National Council of Architectural Registration Boards. Emily is passionate about youth empowerment, with considerable experience teaching and mentoring in schools and camps. She’s an ardent weightlifter, hiker and nature enthusiast, embracing the Vail Valley’s active, outdoor lifestyle. Trish grew up in Northern New Jersey, playing club and varsity soccer, enjoying ski club with friends, and learning to snowboard at a young age. As a teen, she competed in various equestrian events, highlighted by working for Frank and Mary Chapot to train Olympic-level show jumpers. Eventually faster hobbies were necessary, and Trish became a driving instructor for the SCCA and track-day rider on her CBR600RR. She’s also been an enthusiastic racer on our company ‘ski team’. When a new project surfaces, she’s pleased to slow down enough to collaborate with the team. Tom, one of our most valued, gifted leaders, passed away unexpectedly in March, 2017. Together with his joyful spirit and hilarious, dry wit, he enhanced our studio with a wealth of design and management experience. Tom will never be replaced. He was the type of person, father, leader and mentor to which we all aspire, and the fruit of his efforts will live on…, in his son, in us and in our projects. Since 2010, annually recognized as one of the finest architects in America by Design Intelligence, the nation’s most respected voice of the profession. 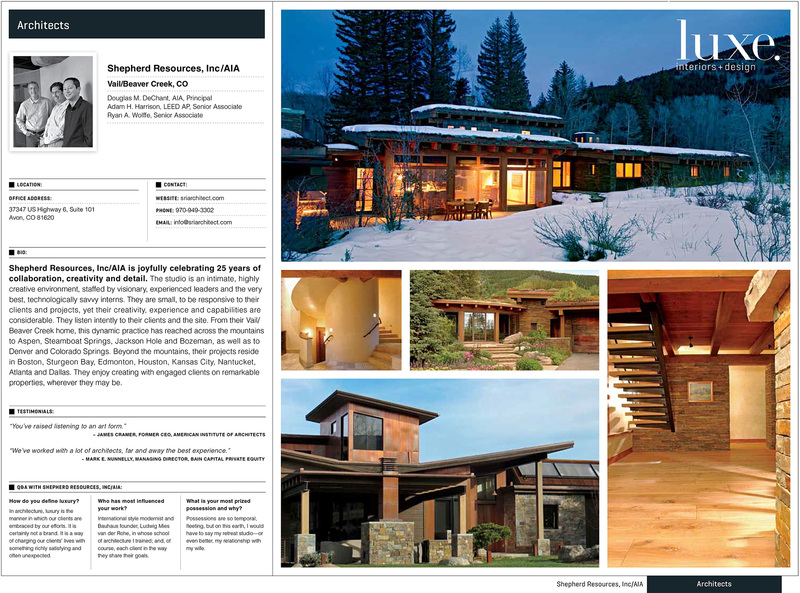 Featured in Mountain Living's exclusive guide to the most talented and influential architects and interior designers at work in the West today.